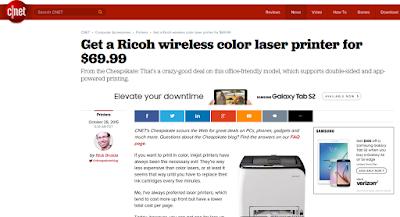 Today's Cheapskate Blog - via Cnet - is touting a Ricoh color laser printer for $69.99 via online retailer Adorama. That is a crazy-good deal, and not unusual for Rick Broida - the face behind the Cheapskate. I've used Rick's guidance to get great deals on PCs, storage products, power adapters, and accessories for years now. While I have yet to meet Rick, I do enjoy his commentaries as well, that come along with his daily (or nearly daily) deals. Today's on color printing is classic - reflecting end user attitudes that favor laser printing over inkjet printing, even in 2015! If you want to print in color, inkjet printers have always been the necessary evil: They're way less expensive than color lasers, or at least it seems that way until you have to replace their ink cartridges every five minutes. 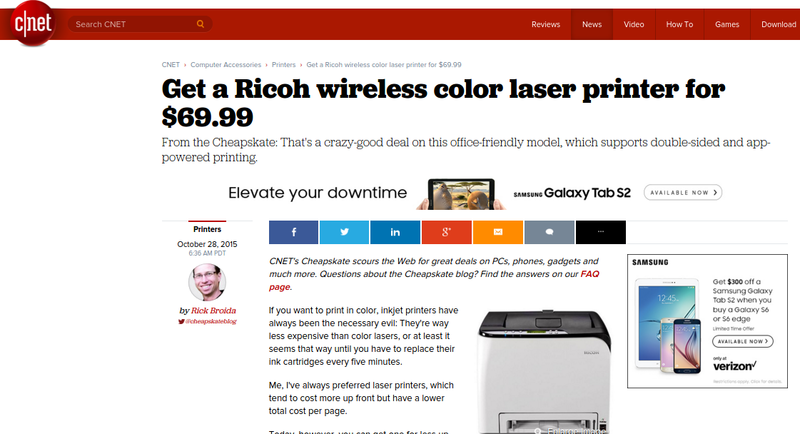 Me, I've always preferred laser printers, which tend to cost more up front but have a lower total cost per page. October Observations - Happy Lifelong Learning Day! This is the first screen in the brief "Lifelong Learning Day" video - what a fit with my "ten year thing"! Yesterday I posted a brief note observing the 10-year anniversary of my final day of work at HP (see "Ten Years After"). It was a simple "milestone" post, about an anniversary I did not want to pass unnoticed. But about the same time I was prepping the post, I heard an NPR underwriting announcement from Road Scholar, with the news that today (October 15) is the inaugural National Lifelong Learning Day, which they sponsor. Road Scholar is a 40-year-old organization based in Boston, billing itself as "the world's largest educational travel organization for adults", and while I have yet to take one of their trips, I have been well aware of several and hope to join one of their adventures sometime in the near future. 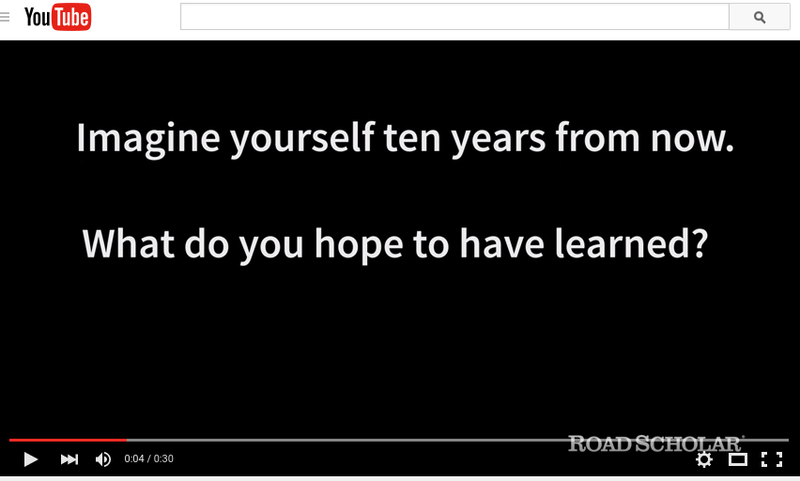 And when I sought out a little more information about Lifelong Learners Day and found a YouTube video (screenshot above), I was a bit stunned, and pleased, to see their reference to learning and "ten years from now" -- looking back at my post-HP decade, learning has been a continuous theme for me. Of course, becoming a columnist/blogger/analyst in the printing and imaging industry was a huge part of my past ten years, and commenced almost immediately after leaving the corporate world. While I had a great deal of industry knowledge to apply from the beginning, learning the ropes of traditional hard-copy newsletter reporting (writing style, editing cycles, deadlines, etc.) was a challenge. And that was followed almost immediately by setting up and publishing my own independent blog (this one), and evolving with social media including becoming fairly expert on many of the latest and greatest platforms. But I will have more on that journey in next month's Observations. Within a year of leaving HP, I was fortunate to have a fellow company alum who left the same time I did (it helped that he was a long-time friend as well) guide me into the world of college-level teaching with the University of Phoenix. Based on my career background and MBA-level education, I was deemed qualified to teach both undergraduate and graduate Marketing and Economics, at both our local on-ground campus as well as online, following successful completion of an excellent faculty training program. 80+ courses later, I still learn a great deal about my subjects during each course, and am very grateful for the continuing opportunity to pass along a little of what I've learned throughout my education and career to younger generations. Plus, the pressure to "know your stuff" when lecturing or grading papers does wonders for motivation for getting caught with your subject! 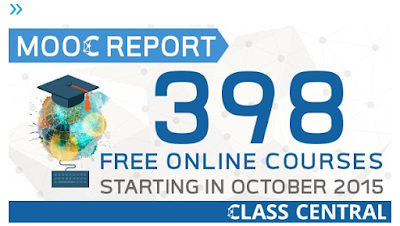 Eager to build my skills, and also just plain curious to be on the other side of the online learning equation (i.e. being a student), I have enrolled in and completed more than 30 Massive Open Online Courses (MOOC's) over the last four years. Also, the value of enrolling and completing can be overstated - in addition to everything I've learned from those successfully completed courses, I've also learned a ton from some of those enrolled-but-not-completed choices too! As I wind up this look at my personal lifelong learning journey over the last ten years, I must mention my hometown resource that I continue to enjoy. That is the Osher Lifelong Learning Institute at Boise State University. The program offers classroom experiences for the 50+ crowd, with some of our area's leading professors (from BSU and elswhere), as well as with leading experts from beyond academia. The offering is rich and diverse, and just today (Lifelong Learning Day!) I will be spending two hours in the morning in an "Art, Architecture and Culture of Venice" course, as well as two hours in the afternoon attending the middle of five weeks' worth of lectures on the "History of London since 1666". 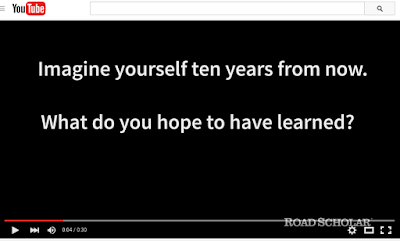 I am committed to learning more in the next ten years, to answer the question from the Road Scholar video! Organizing my thoughts and experiences enough to record them here in what I hope is a reasonably cognizant fashion has been a pleasurable if somewhat indulgent exercise. But I hope too that at least some readers can find a tip or two here to facilitate their own paths of lifelong learning! I have used this legendary band-name as a headline (but not the image) in the past, but today it seems appropriate again for my today's anniversary. Ten years ago today, I put in my last day as an HP employee. It was a great run for me, starting in 1981, spanning a period when Hewlett-Packard was deemed among the most admired companies out there. I have had a very fulfilling "second career" since, which I will be reflecting on here in the coming days and weeks. So just a note for now, and assurance I am eagerly looking ahead to the next ten! Today's announcement that EMC will be acquired by Dell in a $67 million deal is notable for many reasons. It's the biggest tech merger ever, and the largest deal of all time where a private company (Dell) will be taking a public company ($EMC) private. But it also teases out some pretty ancient memories for me, and coincidentally I will mention my first job at HP for the second post in a row! (See "Revisiting Splitsville"). A check at Wikipedia reveals EMC was founded in 1979 as a provider of third-party disk storage for Prime Computer. But as they branched out, the Disk Memory Division (DMD) of HP became very aware of them, as a "parasitic" supplier of disk storage for HP minicomputers. As a captive supplier of disk storage ourselves, DMD was in a generally excellent business position and was for a time the HP division with the largest revenue of them all - more than that of even the minicomputer divisions we supplied. But following IBM's lead and their approach to third-party suppliers of disk storage, we saw it as a scourge that needed to fought off aggressively. That was about 30 years ago, and it is amazing to think that EMC has had such a prosperous history since!